This is a picture of our two most recent house guests. While they are living in the house right now, they will be moving outside later, in the early Summer. What you are looking at are two dwarf citrus trees that we purchased with the hopes of getting some citrus fruit from them to use in the kitchen. Our two house guests traveled all the way from California to be transplanted into clay pots here on Glen Road. Come and watch from their arrival to transplant. Here’s hoping for some oranges and lemons later this season! Our citrus trees are a dwarf variety, which is a plant that is grafted onto special rootstock that prevents the tree from growing too large. We chose two to three-year-old dwarf trees as they will produce blooms and fruit much faster than a younger tree. From research on various internet sites, we decided to purchase our trees from Four Winds Growers, http://www.fourwindsgrowers.com. Four Winds Growers is located in Winters, California. 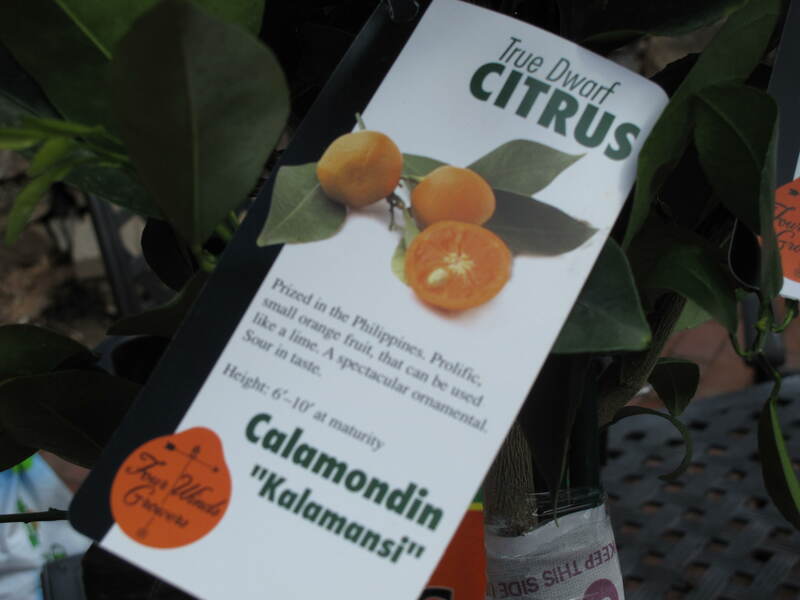 Their founder began propagating and growing quality dwarf citrus trees in California about sixty years ago because he believed the gardening world needed more choices than just the little orange dwarf trees available only from Florida at the time. Today, this four generation, family owned nursery continues the tradition. They now grow over 250,000 quality dwarf citrus trees for containers and home gardens each year. We selected two varieties to grow in our home. 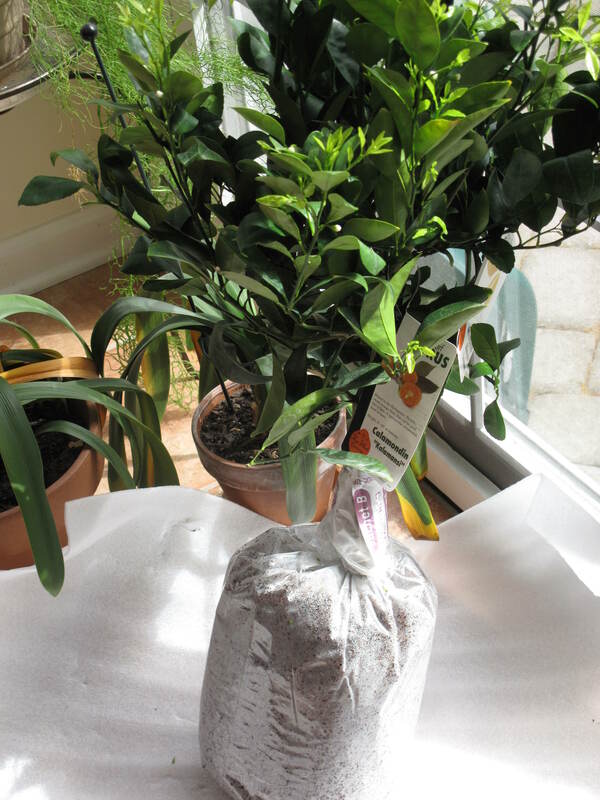 An ‘Improved Meyer’ lemon tree and a ‘Calamondin’ orange tree. 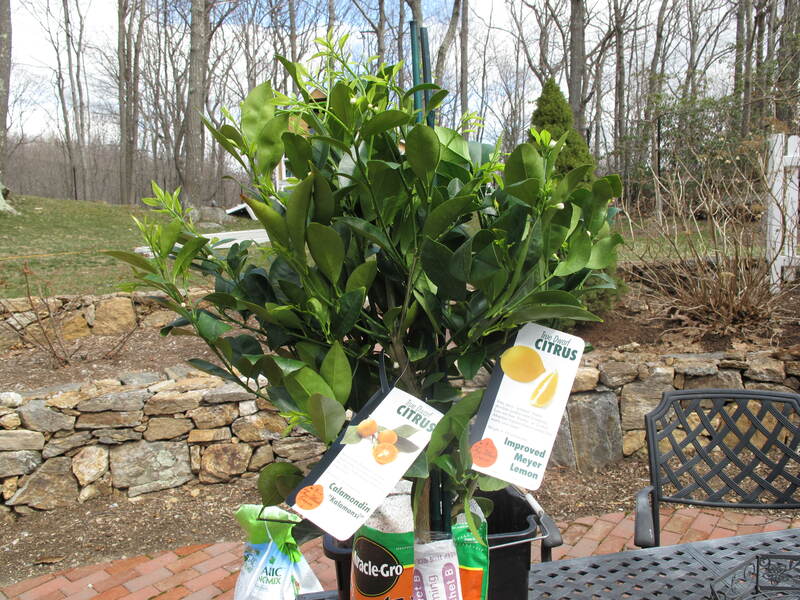 Each was noted as being excellent for beginners and for container citrus gardening–indoors and out. 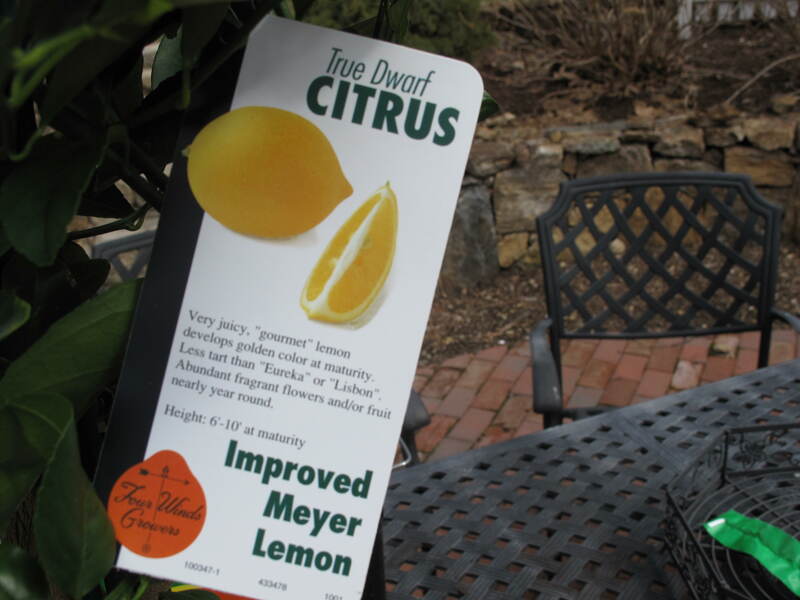 ‘Improved Meyer’ dwarf lemon is a favorite cooking lemon. This small, evergreen tree bears fragrant white flowers and lovely, yellow-orange fruit. Its small habit, glossy, deep-green foliage and year-round attractive form make it excellent for the home garden. 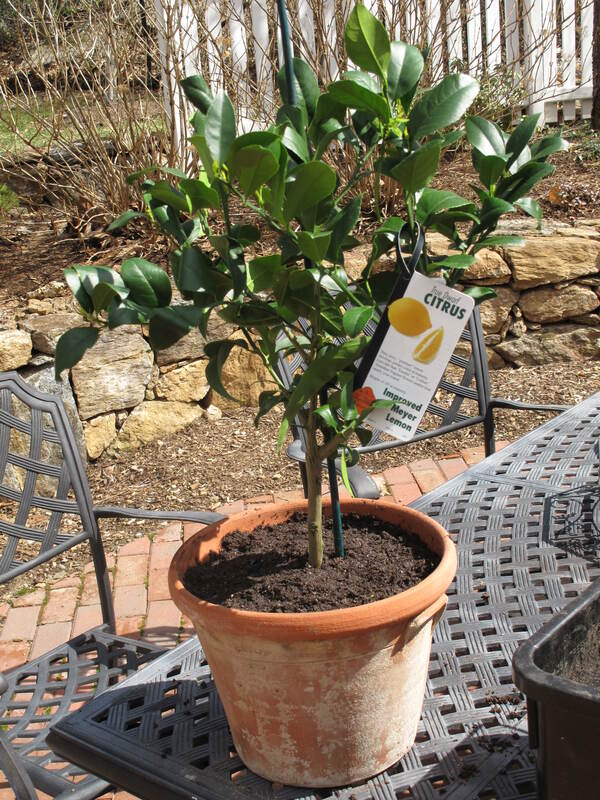 More cold tolerant than the standard lemon, this variety is also sweeter and has fewer seeds. Grown in containers, it can easily be moved indoors in colder climates, where it will continue to produce fruit. The ‘Calamondin’ orange, a cross between a kumquat and an orange, is a favorite among gardeners for its variegated foliage and its small ornamental fruit. The flowers are extremely fragrant and the fruit, which is very sour, is used to make marmalade. Once established in a pot, the ‘Calamondin’ orange is very easy to grow. Keep it in full sun and fertilize it twice a month in the active growing season. It will flower in late Winter or early Spring and fruit thereafter. The fruit will hold on for an awesome ornamental display for months. The first time we ordered from Four Winds, our order was cancelled. The simple reason–it was too cold of a journey. The second time we ordered, the weather was warmer and we chose two-day shipping. When the trees arrived, they had an interesting attachment above the root. The attachment was a warming sachet. Its purpose was to keep the trunks of each tree warm during shipping. 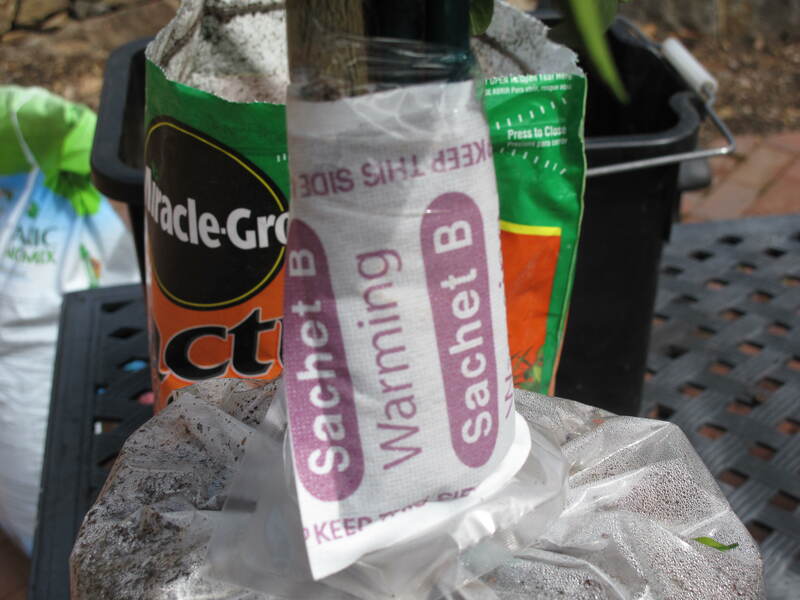 Even when we opened the trees two days later, the sachet was still warm to the touch and helped keep the trees alive during their journey from California to Connecticut. A well-drained soil was encouraged in the research that we performed. It was recommended to use a slightly acidic (pH 6 to 7), loam-based potting mix. 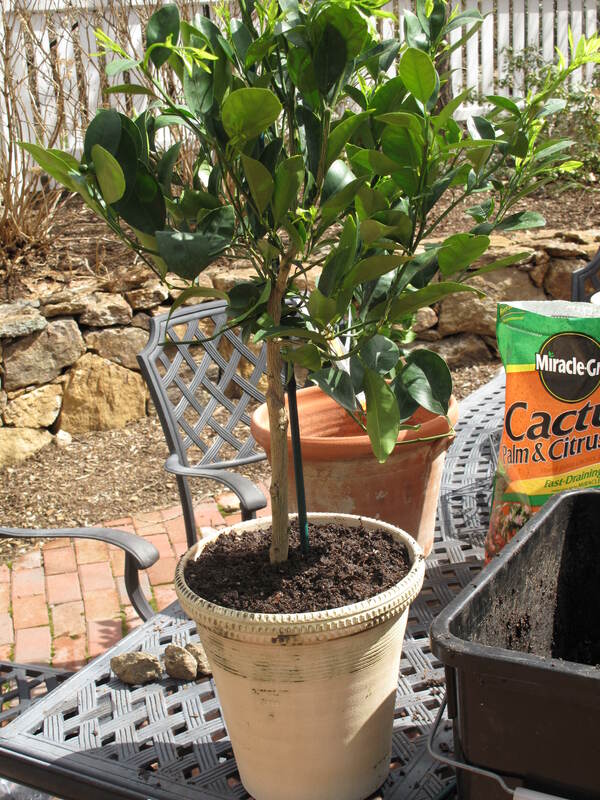 Instead of mixing our own, we purchased a premixed potting soil formulated specifically for citrus trees. 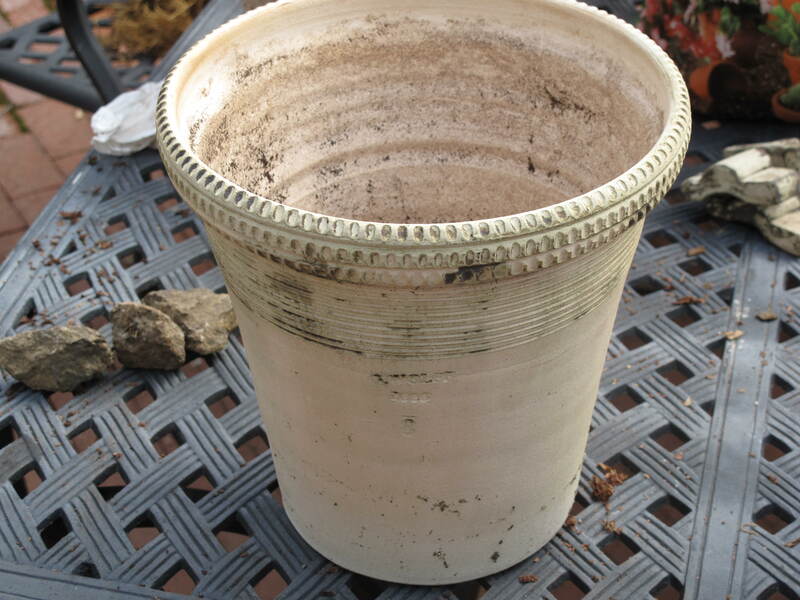 We moistened the soil and then placed it into two pots with each tree. Here is the ‘Improved Meyer’ lemon tree. Last but not least, here is the ‘Calamondin’ orange tree. Both trees are now resting peacefully in our kitchen in a bright and sunny, south-facing patio door. We will need to get started hunting for marmalade and Meyer lemon recipes. Maybe we shouldn’t get ahead of ourselves….we can wait until at least they bloom or form fruit before we look for recipes. We can’t wait for that to happen. We’ll keep you posted on their success here on Acorns On Glen. Do you have any great citrus recipes that you can share here on Acorns On Glen, especially orange marmalade or Meyer lemon recipes? This entry was posted in Gardening and tagged Blog, Food, Life, Nature. Bookmark the permalink. 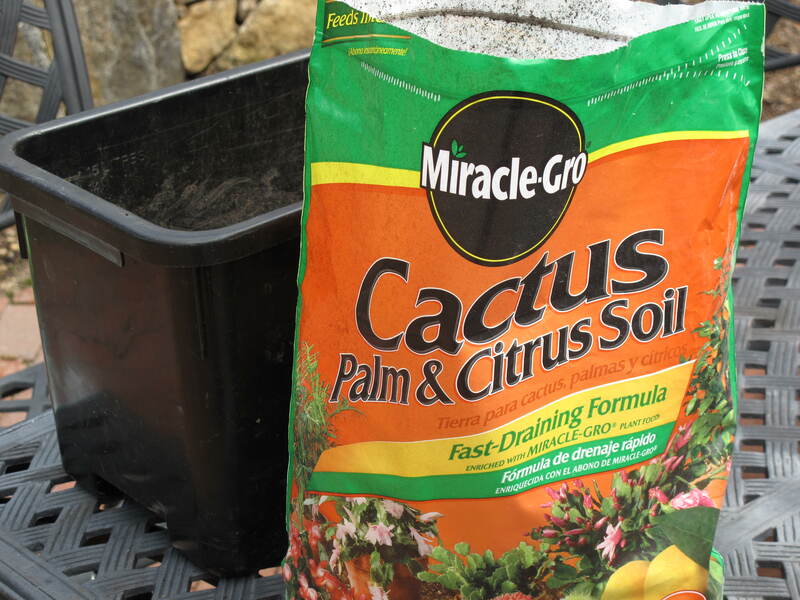 Where did you get the Cactus Palm and Citrus soil? Hi Kathy D. Believe it or not, I purchased the soil on http://www.amazon.com. It came in two days. It seems that Amazon is not just for books anymore. Come back and visit soon. I would like to place my order for Orange Marmalade – it is my absolute favorite! Hi Susan. Welcome to Acorns On Glen. You will absolutely be our first customer for the marmalade. I just have to figure out how to make it. Just hoping my tree produces the fruit. Come back and visit soon. Thanks for your comment. I love this marmalade but it is tart, but you can add more sugar…. Hi RaeDi. Welcome to Acorns On Glen. Thanks so much for your comment. I will be checking out your recipe. We need some fruit first, but this will sure help when we are ready. Come back and visit soon.